"Sport" and "perpetual calendar" (they use the french "Quantième Perpetuel") usually aren't terms you hear in the same sentence when discussing high-end mechanical watches. But to be ballsy, that is what DeWitt did with the Academia Quantieme Perpetuel Sport watch. 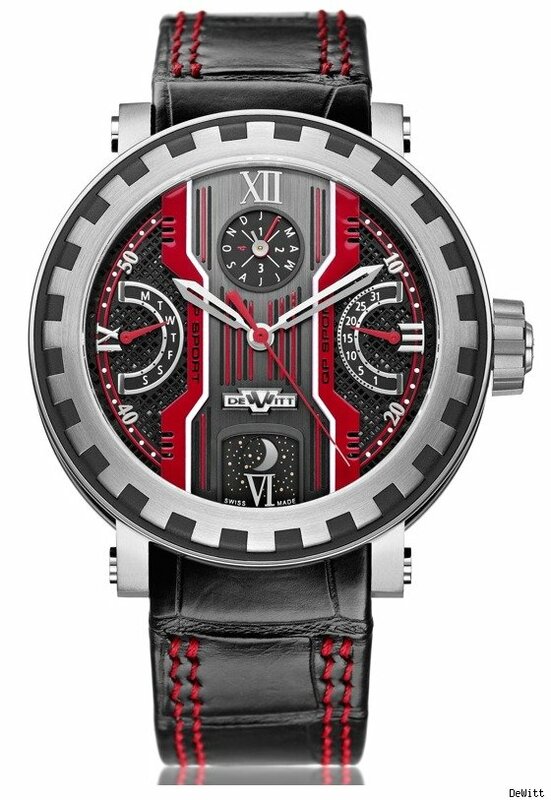 The amazingly loud design of the case and dial is sporty and bold. Certainly not for everyone, a good amount of people will appreciate the architectural complication that the design offers. The watch isn't new, but this red bathed version is. Logically this watch should not look good. If you explained the concept of it to someone on paper, you'd be describing a mess. Though it does in fact seem to be greater than the sum of its parts. It comes across as cool - certainly more so that the original Academia Quantieme Perpetuel watch. DeWitt Academia Quanti�me Perpetuel Sport Watch originally appeared on Luxist on Fri, 15 Apr 2011 16:01:00 EST. Please see our terms for use of feeds.